Sunnyvale, California – September 22, 2011: Vitria Technology, Inc. announces the release of the Vitria Operational Intelligence for Service Assurance Solution. Built on the M3O Operational Intelligence Suite, the Service Assurance Solution makes it easy for Communications Service Providers and Smart Grid Energy Utilities to implement real-time monitoring and analysis of integrated network and business service issues, gaining real-time insight into service delivery to optimize the customer experience. The growth of smart phone and smart grid usage has increased the expectations and demands of customers on service providers. “Smart” customers have demonstrated a willingness to switch providers and pay a premium for a higher quality of service. As a result, 80% of service providers now claim customer service as a top priority. However, traditional network-centric service assurance solutions lack insight into customer behavior and the impact of network performance on their customers. As a result, call centers are overloaded as service providers attempt to resolve customer issues using historical data and reactive customer experience management processes. Vitria Operational Intelligence for Service Assurance enables the predictive and proactive identification, prioritization, and resolution of service quality alerts and issues, often before they impact the customer. Vitria provides real-time problem diagnosis and root cause analysis to accurately locate the cause of service degradation issues. Real-time information is then presented as a common operating picture in a “live,” role-based dashboard, with drill-down capabilities for deeper analysis and correlation of events. The result is the faster detection, analysis, and response to problems for a totally optimized customer experience. Even more so, the combined real-time analysis of network and customer data enables service providers to create personalized service offerings, based on patterns in customer behavior that maximize revenue per user. The Vitria Operational Intelligence for Service Assurance Solution and the M3O Operational Intelligence Suite are available on premise or in the cloud. To request a demonstration of Vitria Operational Intelligence for Service Assurance, please contact pr@vitria.com. 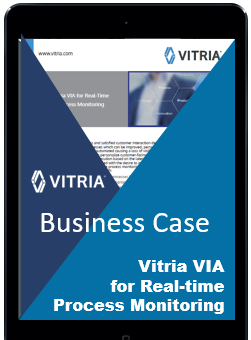 Vitria Technology, Inc. provides the industry’s leading Operational Intelligence suite, empowering partners and customers alike to develop innovative Operational Intelligence solutions to analyze business activities in the proper context and take real-time action. The result is faster, better decision making. With a rich heritage as a technology pioneer, Vitria’s award-winning process integration solutions provide the backbone for many Global 2000 companies’ mission-critical business processes. Vitria has customers in North America, South America, Europe, Asia, and Australia.